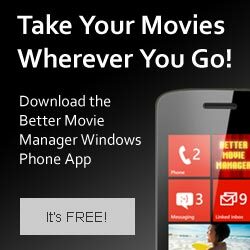 Better Movie Manager accounts are 100% free! Better Movie Manager is just that, a better way to manage and enjoy your movie collection. Once added to your collection, you will be able to access each movies' actors, directors, trailers, genres, and more. View how many movies you own broken down by format, rating, and genre. Also see which actors and directors are in the most of the movies you own. Search your collection by title, rating, runtime, actor, and more. It's never been easier to search your collection for just the right movie to watch. Have some movies that aren't in your collection yet but hope will be soon? Add them to your wish list then send the link to your friends and family. Easily keep track of the movies you've lent out and to whom you've lent them. "I tried many different programs to help manage my movie collection but none were as easy to use or had as many features as Better Movie Manager." "I use Better Movie Manager to search my collection for just the right movie every time we have friends and family over for movie night."